The new G-Changer radiator generation from Phobya has arrived! The choice of material is the basis for any great radiator. Copper fins and brass chambers are the traditional and proven materials for radiators with outstanding performance. The whole radiator was coated with a robust black lacquer. The fins are coated with a thinner layer to improve the appearance without compromising cooling performance. The Phobya logo was machined into the sides of the radiator to show that this radiator is a serious heat exchanger. Based on the right choice of material and design the Phobya engineers have implemented many technologies to achieve outstanding cooling performance. The first idea was that improved flow rates result in improved cooling performance. Therefore the G-Changer series feature parallel double cooling channels to greatly reduce flow resistance of the radiator. The fin spacing and size was chosen to work efficiently even with medium-speed and slow fans to achieve the best noise- to performance ratio. The unique design of the fins of this 60mm thick heat exchanger additionally allows great performance increases when using High-powered fans which makes it extremely versatile and perfect for any application! What good is great performance if the radiator is a pain to install? To make installation quick, easy and safe the engineers at Phobya came up with another innovative concept: The radiator is equipped with connection threads both on the front and bottom which greatly increases the possible mounting locations of this radiator. The two included black thread sealing plugs safely seal the two unused threads shut. The M3 threads in the sides of the radiator are another new feature which promises greatly eased installation: These threads allow quick and rigid installation of the radiator in 5,25" drive bays. For easy deaeration of the radiator a bleeding screw was integrated at the highest point of the back of the radiator. When filling the system simply open the screw slightly until all air is bled from the radiator. Then screw the cross-slotted screw in again and you are set to go with a completely bled radiator! 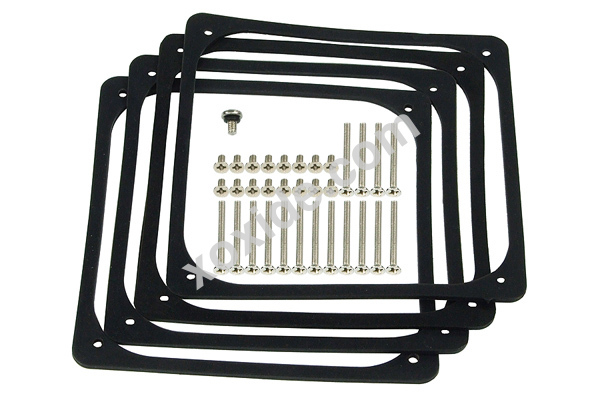 The radiator is shipped with decouplers which can be inserted between fan and mounting frame. When the mounting screws are fastened the radiator and fan form a unit which directs Airflow directly onto the fins which ensures the best possible cooling performance. A new feature of the now completely black radiator are now the brass seal caps in black nickel. The version 1.2 means that the sides are fixated by a more complicated and better-looking process!